This is... actually really heartwarming! In 2016, Grandma Wanda thought she texted her grandson about Thanksgiving dinner until she got a text "who is this?" Turns out she had the wrong number, asking a teen named Jamal instead. They celebrated that year together..and in 2017. When does a meme cross over into being this beautiful kettle of hope that we all deep down want to have? I guess it’s the longevity. It’s the effort. It’s the honest passion. Like, take this story for example. 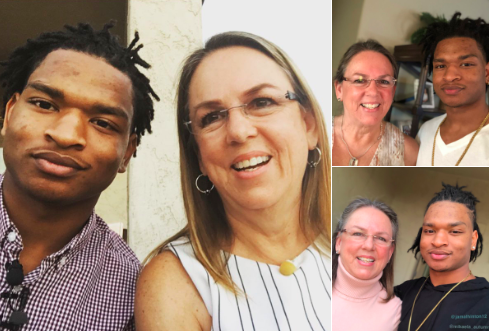 After a then 59 year old woman named Wanda Dench accidentally texted a teen named Jamal Hinton about Thanksgiving dinner, thinking he was one of her grandchildren, the result was an unexpected connection after Wanda invited Jamal to Thanksgiving dinner after Jamal jokingly added, “you not my grandma. Can I still get a plate tho?”, to which Wanda responded, “you sure can, that’s what grandma’s do”, and the invitation was extended to Jamal’s entire family. Now the story is kind and heartwarming, showing the connection between two human beings goes deep, and the warmth of food and home unites many. However, the connection goes deeper when you realize that this pair who is only here because of a grandmother’s texting error, has been meeting up for Thanksgiving every year. Jamal posted the photos on his Twitter account (@kingjamal08) of the pair’s last three Thanksgiving’s. Explaining to a local news person, as embedded above, the pair connected beyond text, even having dinner together every few months and, as Wanda explains, Jamal is “awesome”. Jamal plans to continue to reveal more about this odd pairing, promising a video with Wanda and her husband on the youtube channel here shares with his girlfriend, “Jamal andMikaela”. As for Thanksgiving — Wanda next year hopes to visit Jamal in 2019, handing over the holiday to the younger generation, in her own words. It’s a heartwarming story for a holiday that we love to see bring out the best in people. What do you think of this heartwarming story of a wrong text gone right? Let us know in the comments or on Twitter at @WhatsTrending.